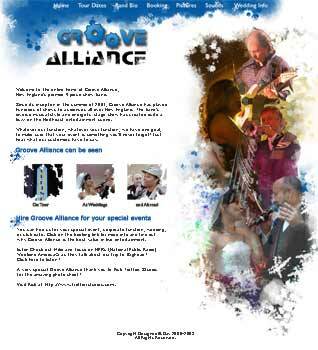 Since its inception in the summer of 2001, Groove Alliance has played hundreds of shows to audiences all over New England. The band's diverse musical style and energetic stage show has created quite a buzz on the Northeast entertainment scene. Designed By Day worked with band members to develop some fresh new looks for their website, however the website development ended up delayed due to the band taking a tour of Iraq to play for the troops.